Affordable PricingLow price, high quality. Get a quote forconsult, design, printing or for full service.DIY is free at our Vectoriole Project. Pinpoint ReportsDetailed reports are the norm. Buy a Template or we can Custom Design to your SpecsPage layout work can be tedious. We can take care of the layout and data integration. 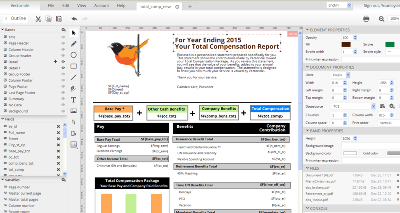 Total Compensation & Benefits Statement Samples & Examples. Click images for more detail. An example of a simple, 1 page and 1 sided employee benefit statement that covers the basics. A variation is now available at Vectoriole. An example of an 8.5" x 11", 2 sided employee benefits statement that covers the basics. Variation available at Vectoriole. The back of the statement includes the employee's address positioned to show through a #10 window envelope. Z fold. A basic benefits summary. This benefit statement is similar to # 2 left, but uses the left page column to display the employee's enrollment & contributions for a variety of Voluntary benefits. This statement would have quite a bit more embedded data, queries. This basic employee benefit statement 'style' is popular. Each benefit includes a benefits summary. 11" x 17", duplexed, landscape & center fold. This benefits statement provides a more detailed approach to employee retirement communications, helping employees understand specifically what needs to be done to achieve a successful retirement. Heavy 'background calculations' & use of FV's, NPV and PMT but with a very simplified presentation to the employee. Once again, each benefit includes a VDP benefits summary. This benefits statement is printed 'portrait', tumbled & then double folded. If the layout is offset a bit, can be trimmed to 10.5" x 16", allowing it to be stuffed into a #12 window envelope which helps to reduce postage. More than just numbers, it includes a variable benefits summary. This particular employee benefits statement is initially printed on 11" x 17", but is then trimmed to 9" x 16", allowing it to fit into a #10 window envelope.Once again, this can reduce your per employee postage by $.61 + additional savings on the actual envelopes. Descriptive, but brief benefits summary. This benefits statement is 11" x 17", duplexed. The unique feature here is that it is side-by-side bilingual, English and Spanish. Since the available space is divided in half, there is a bit less content - but it is in two languages. Note that we do not perform the Translations. A bilingual HR person at the company supplies static and variable Spanish. Multilingual benefits summary. Companies frequently will have a 'look' for Salaried that is different than that for Hourly. Having an entirely different theme can actually save time - as the data can be split into 2 separate groups of files. As a result, we need not worry about intermingling different benefits - or writing quite as many nested 'if-then' statements. This Total Compensation Statement includes employee beneficiary and dependent listings, as does the example to the left. 11" x 17", duplexed,portrait benefits statement trimmed to fit a # 12 Window. This example is dense. The HR Department didn't want to leave out anything. We obliged. There are some intense retirement calculations under the hood of this document. The Benefits summary descriptions are also variable data. An 11" x 17" Total Compensation & Benefits Statement, duplexed, portrait - then trimmed to fit a #10 window. This one is collated with Annual Pension statements which are printed by the companies Actuarial firm. One of our challenges is working with a different vendor to print in a specific sequence for four different sets of employees. If their sequence was different than ours - it would be difficult to collate & stuff. (Many thousands of personalized docs). Good thing we can work with SQL.Includes brief, variable data benefits summary. This benefits statement was simple. Personalized data was not merged into the static text - and retirement communications were carved out as a special, targeted communication. Fewer numbers, more Benefits summary info. Three variable data charts, very deep retirement analysis to include integration of Social Security, Defined Benefit Pension, 401(k) and Deferred Comp. Required collaboration with multiple vendors and JOIN of > 50 files. Variable nesting of benefits summary. You need to have employees that are very serious about their benefits before you consider this benefits statement. Multi-level retirement calculations. Two - 11" x 17" pages, duplexed, centerfolded and stitched. Opens like a magazine for 8 full pages. Includes variable data benefits summary. An offshoot of this statement could be used for Reduction in Force, where an employee could see the ramifications of choosing early retirement. All Statements are now available as Printed + PDF + HTML5 format. At no extra charge. To the left: $500, includes installation, 10 hours of instruction/consult/modification. Assistance in data integration, modifications as required, calculations, JOINS, charts and data integration. Includes up to 200 duplexed (2-sided) full color printed. Each employee thereafter for $1.Folding, shipping, envelopes not included.